LAS VEGAS, June 6, 2018 /PRNewswire/ -- Revolutionary Direct View LED and OLED technologies, ultra-narrow bezel video wall displays and new-to-the-market digital signage solutions, LG Electronics USA Business Solutions are headlining the InfoComm 2018 trade show that opens here today. "Our major presence at InfoComm this year shows how LG prides itself on providing forward-thinking, innovative solutions that are both highly functional and key business drivers," said Garry Wicka, Head of Marketing, LG Electronics USA Business Solutions. "As digital signage applications and technologies continue to advance, LG is committed to being at the forefront of innovation, whether it's delivering new-to-the-industry solutions, innovative new product concepts, or expanding capabilities in our next-generation displays." Visitors to LG's booth at InfoComm 2018 in Las Vegas (June 6-8, Las Vegas Convention Center, Central Hall, Booth #2546) will experience first-hand LG's full lineup of digital displays and their countless installation applications. 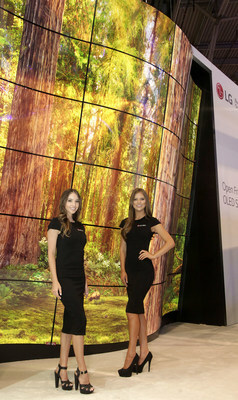 For more information on LG's commercial display portfolio, please visit www.lgsolutions.com. Exhibiting its industry leadership in, and commitment to, the large-screen video market, LG offers a host of indoor and outdoor Direct View LED display solutions, including 1.0, 1.5 and 2.0mm pixel pitch indoor displays. LG's Direct View LED displays produce outstanding color contrast, saturation and brightness levels and are now available for both custom order – and now, new pre-arranged bundle packages – for a variety of installation applications, including retail spaces, sports stadiums, transportation hubs and hospitality applications. At InfoComm 2018, LG will introduce slimmer-bezel versions of the 65-inch Ultra HD "Wallpaper," 55-inch Full HD "In-Glass Wallpaper," and 65-inch Ultra HD video wall LG OLED displays with a new super-slim bezel overlap seam (see separate release). LG will also showcase the highly-acclaimed LG OLED Canyon, which first made a splash by wowing attendees at CES® 2018 with its winding LG Open Frame OLED panels in convex and concave configurations. LG's proprietary OLED technology delivers perfect blacks, infinite contrast and incredible color from wide viewing angles, and are sure to elevate retail environments and art galleries with their cutting-edge picture quality. New in 2018 are 55-inch ultra-narrow 0.6 mm even bezel displays (model 55SVH7E) that can be combined to create one powerful and impactful video wall ideal for displaying content that resembles one continuous image as opposed to a collection of segmented panels. The new video wall expands LG's portfolio of narrow bezel video wall displays, which includes VH7B, VM5B and VM5C series, all touting 0.9mm bezels. LG's proprietary In-Plane Switching (IPS) technology ensures uniform, accurate color from virtually any viewing angle, empowering these video walls to produce unparalleled picture quality sure to capture any viewers' attention. Within its broad portfolio of transformative digital signage solutions, LG offers displays with inventive form factors and never-before-seen aspect ratios, including the LG Transparent Color LED film display and the LG Ultra Stretch displays. Building off LG's highly-acclaimed Transparent LED Film display introduced at InfoComm 2017, LG now offers the same innovative display in color, delivering an entirely new category of displays to the market (see separate release). LG's unique Ultra Stretch displays also redefine the creativity and flexibility possible for digital signage with their irregular aspect ratios and ability to act as stand-alone displays, be layered together, or be installed in a square pillar, making them a great fit for retail, wayfinding, transportation, museum and QSR applications. LG offers an array of technology solutions to meet the changing needs of the QSR sector, including ultra-narrow video walls, 4K UHD displays, Ultra Stretch displays, Transparent LED Film, and ultra-premium large format indoor and outdoor displays. LG's unique outdoor kiosk displays come equipped with temperature tolerance technology to alleviate overheating and prevent compromised picture quality and their environmentally sealed structure for waterproofing protects the display from dust and fumes. All available indoor and outdoor displays in LG's QSR digital signage portfolio utilize LG SuperSign, LG's easy-to-use content management and editing software that offers seamless control from remote locations. LG's commercial display portfolio also includes a wide variety of guest-centric technologies for hospitality environments. Leading the 4K Ultra HD revolution for hotels is not only the first-ever OLED TV designed specifically for hotels (model EW960H), but also the unbelievably thin LG OLED Wallpaper Hotel TV (model 65EV960H), which is less than two-tenths of an inch thick. LG's extraordinary OLED hotel TVs have already begun elevating the in-room experience for guests at hotels across the country with their perfect blacks, intense colors and infinite contrast. LG also offers seven series of LG 4K Ultra HD hotel TVs enhanced with LG's Pro:Centric® interactive TV platform and the Pro:Idiom® digital rights management system, as well as a portfolio of products specifically designed for the hospitality market, including the LG Styler™ steam clothing care system and the LG PuriCare™ air purifiers with powerful cleaning and intuitive air quality sensors. 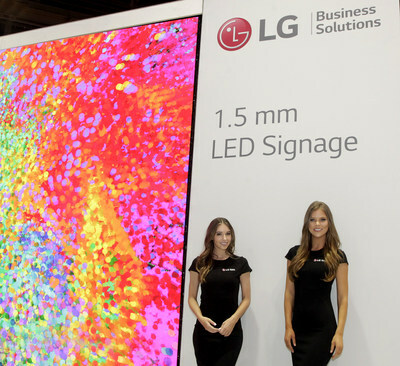 LG Electronics USA Business Solutions serves commercial display customers in the U.S. lodging and hospitality, digital signage, systems integration, healthcare, education, government and industrial markets. Based in Lincolnshire, Ill., with its dedicated engineering and customer support team, LG Electronics USA Business Solutions delivers business-to-business technology solutions tailored to the particular needs of business environments. LG Electronics USA Inc., based in Englewood Cliffs, N.J., is the North American subsidiary of LG Electronics Inc., a $55 billion global force in consumer electronics, mobile communications, home appliances and air solutions. For more information, please visit www.LGSolutions.com.